For Glory or Honour is a flag on the Cerulean Ocean. For Glory or Honour was founded on December 12, 2011, originally on the Midnight Ocean. It was then transferred onto Cerulean Ocean during the ocean merge. It originally started to blockade islands post-merger. On March 3, 2012, For Glory or Honour attacked Delta Island in the first set of blockades of the Cerulean Ocean. They lost, 3:0. Unfortunately, it was the only failed blockade of that day. 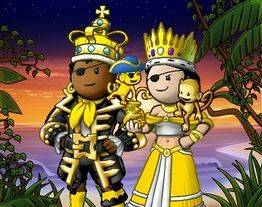 Soon afterwards on March 10, 2012, For Glory or Honour took over Emperor Island in a 0:3 battle after Fleet of his Imperial Scaled Highness claimed it. For Glory or Honour's blockade history was quiet until later that year on September 22, where the flag had to defend their previously acquired Emperor Island against the flag Tyranny. The island was successfully defended in a 3:0 battle. On that same day, the flag Undertow also attacked Remora Island. For Glory or Honour was able to successfully defend it in a 3:2 blockade. On October 27, 2012, For Glory or Honour attacked Ostreum Island, governed by Boochin Katfish. The island was won in a 0:3 battle. For Glory or Honour's first blockade of 2013 was a success. On January 12th of that year, they blockaded Delta Island, defeating Curse of the Black Pearl in a 0:3 battle. On February 16, 2013, For Glory or Honour lost Ostreum Island to Maniacal Menagerie in a 0:3 battle. On February 23, 2013, For Glory or Honour teamed up with the flag Kittens to attack Guava Island. For Glory or Honour dropped out in the second round, though Kittens was successful in claiming the island in a 0:3 battle. Dazed n Confused joined the flag on March 27, 2013, and on the following day, an alliance with Otherworld was forged. On May 25, 2013, due to ongoing hostilities with Tyranny, For Glory or Honour lost Delta Island, Remora Island, and Emperor Island. However, they were able to claim Cranberry Island. What is a man's idea of helping with the housework? Lifting his leg so you can vacuum. This page was last modified on 10 October 2016, at 13:56.